An employee benefit structure where by the employee may choose their own combination of benefits (generally health and retirement) that best meet their individual needs. A type of option that allows the purchase of a specific number of shares at a specified price by a fixed date. A bond provision that allows the bond issuer to redeem the bond prior to the bond's maturity date. If the bond states that this provision can be exercised after a given number of years, or at a price greater then the par value, or that the bond is not callable, the bond is said to have call protection. A form of investment risk when a bond may be called, or redeemed prior to maturity, and that the investor will be unable to reinvest the principle for the same or a higher rate of return. This risk increases when interest rates are falling and it becomes more attractive for the bond issuer to call their bonds with the higher interest rates and issue new bonds with a lower interest rate. Most bonds that have a call provision have some protection for a specified number of years. A bond that has an option that can be exercised by the issuer of the bond to redeem the bond prior to the maturity date. The provision will state the times and price that the bond may be called at. An individual health insurance or property and casualty policy that may be canceled by the insurance company at any time before its expiration date. A form of dread disease insurance that covers only cancer. The maximum coverage amount that an insurance company can underwrite or reinsure. The profitable result of the sale of a security or asset whereby the net sales price exceeds the net cost at date of purchase. A category of mutual fund investment with an objective of capital appreciation as opposed to income from dividends. This category would generally include common stocks of well-established companies with growth potential. The difference between the net cost of an investment and the net sales price when the asset is sold at a loss. A form of investment risk that the investor may lose all or part of the capital (principal) invested. This is a measurement of the value of a corporation. Market capitalization is determined by multiplying the market price of the stock by the number of issued outstanding shares. An agent that is contracted with only one insurance company and is not permitted to sell products of other carriers. Also known as exclusive agent. An insurance company that has been formed and is controlled by a separate company with the purpose of providing insurance to that company. The insurance company that underwrites and issues the insurance policy. The insurance company is said to carry the risk for the policy owner. An annuity contract that pays the income benefit for the life of the annuitant and in the event that the annuitant dies prior to the income received equaling the premiums paid, the beneficiary will receive the difference in a lump sum payment. In this form of annuity the insurance company guarantees to return at least the amount of the premiums to the annuitant or to his or her beneficiary. The dollar amount that the policy owner is entitled to upon surrendering a cash value life insurance policy. The amount is determined by taking the account value of the policy and deducting any surrender charge and any outstanding policy loan and interest thereon. Also see nonforfeiture provision. The accrediting body for the Associate of the Casualty Actuarial Society (ACAS) and Fellow of the Casualty Actuarial Society (FCAS) designations. Members have taken and completed a series of examinations on actuarial mathematics and related topics as they apply to the property/casualty insurance field. The transfer of a portion or all of the risk written by an insurance company (ceding company) to another insurance company (assuming company) by the use of reinsurance. In a reinsurance transaction, the insurance company that is transferring the risk to the reinsurance company that assumes the risk. A certificate issued by a bank, savings and loan association or other financial institution indicating that a specific dollar amount has been deposited with the institution for a fixed period of time at a predetermined rate of interest. A professional designation of the International Foundation of Employee Benefit Plans and the Wharton School of the University of Pennsylvania. The designation is earned by passing examinations and through business experience. The examinations include pensions, Social Security, other retirement related plans, health insurance, economics, finance, labor relations, group insurance and other employee benefit related plans. In a group life insurance plan, each person insured by the plan is given a certificate of insurance. This document shows the specifics of the coverage including type and amount of coverage as well as the beneficiary. A professional designation awarded by the Institute of Chartered Financial Analysts. A professional designation of the College For Financial Planning that is earned by passing a series of examinations. The examinations include insurance, investments, taxation, employee benefit plans and estate planning. A professional designation of the Society of Certified Insurance Counselors. Members are experienced in the property and casualty insurance field and have passed a series of examinations. Also see The Society of Certified Insurance Counselors Home Page. A professional designation of the Investment Management Consultants Association (IMCA). The certification is granted after completion of in-depth course work and examination at Wharton School of Business to individuals that have also meet experience requirements in investment-management consulting. The curriculum covers asset allocation, ethics, due diligence, risk measurement, performance measurement and investment objectives. Also see The Investment Management Consultants Association Home Page. An individual who has passed various exams and has considerable accounting experience and satisfied the licensing requirements of the state in which employed. 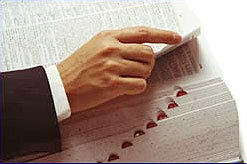 Involvements include accounting and auditing functions, in addition to individual and corporate tax returns. A debt instrument that is secured by personal property such as machines and equipment. A professional designation of The American College that is earned by passing 10 examinations. The examinations include insurance, investments, taxation, employee benefits estate planning, accounting and management. Also see The American College Home Page. A professional designation of The American College that is earned by passing 10 national examinations. The examinations include insurance, investments, law, employee benefit plans, management, employee benefits, accounting and economics. Also see The American College Home Page. A professional designation of the American Institute for Property and Casual Underwriters that is earned by passing a series of examinations. The examinations include insurance, risk management, economics, finance, management, accounting and law. Also see the Chartered Property Casualty Underwriters Society Home Page. An irrevocable trust that pays income to one or more individuals until the death of the grantor. At this time, the balance of the trust passes to a designated charity on a tax-free basis. A rider on a life insurance policy that provides additional protection for the children of the insured under the original policy. The person who submits the claim to the insurance company. A class of mutual fund shares that is offered for sale at net asset value plus an initial sales charge or front-end load usually up to 5%. A class of mutual fund shares that is offered for sale at net asset value with a contingent deferred sales charge that declines to zero depending on the length of time the shares are held. Class B shares automatically convert to Class A shares after the sales charge reaches 0%, usually after seven years. A class of mutual fund shares that is offered for sale at net asset value with a contingent sales charge of 1% during the first year. A form of vesting that was allowed under the Employee Retirement Income Security Act of 1974 (ERISA) that required an employee to complete 10 years of service to receive any retirement benefits. Under the Tax Reform Act of 1986 this requirement was reduced to 5 years of service. A professionally managed company investing in securities which makes available a fixed number of shares to sell to the general public and then closes the fund. Shares are initially sold at market rates with subsequent share values are subject to stock market fluctuation. See Consolidated Omnibus Budget Reconciliation Act of 1985. A reinsurance agreement where the reinsuring company essentially accepts an agreed-upon percentage of the liability of a policy. In return, the reinsurer receives a proportionally equal share of the premium from that policy. A form of investment or mortgage backed bond that separates pools of mortgages into different maturity classes (trenches). This involves applying mortgage principal and interest payments to the pool in the order the CMO pay out. The coverage provided in an automobile insurance policy that insures the insured's automobile against physical damage that results from collision with another inanimate object. Short-term obligations with maturities ranging from 2 to 270 days. They are issued by banks, corporations and other borrowers to investors with large temporary cash positions. Such instruments are unsecured and usually discounted. The fees paid to a salesperson as compensation for generating new business and providing service to the policyholder. The senior state regulator of the insurance industry with the responsibility to safeguard the policy owners of the state. The position may be elected or appointed. Also see the National Association of Insurance Commissioner. A group of mortality tables that have been approved by the National Association of Insurance Commissioners (NAIC) that are used by insurance companies to calculate the minimum nonforfeiture values and policy reserves for cash value life insurance policies. Insurance commission can be paid to the agent in many different forms and using different methods. Bulk goods such as grains, metals and foods that are traded on a commodities exchange. A provision in a life insurance policy to determine the order of deaths when the insured and the beneficiary die in the same accident. If it is deemed that the insured died first, the proceeds are payable to the named contingent beneficiary. Otherwise, the benefits are paid to the insured's estate. A form of corporate ownership whereby shares of stock are held and represent an equity interest in a company. The method of computing interest on a principle sum where the interest rate is applied to the original principle and any accumulated interest. Also see simple interest and Simple vs. Compound Interest. A coverage in automobile insurance that provides coverage for risks other than collision or theft of the insured's car. A form of benefit paid by a property and casualty company on behalf of an insured for alleged negligent acts or omissions. In life and health insurance, evidence of a temporary contract obligating an insurer to provide coverage as long as the premium payment accompanies the application. This allows the insurance company time to review and process the policy, and to issue or refuse coverage accordingly. The process, by which an insurance company or agent, attempts to prevent a policy from lapsing. This is the federal statute that requires certain group health plans to provide a continuation of coverage to certain individuals who would otherwise no longer qualify for benefits. This would include individuals that are layed off, and the death or divorce of the breadwinner. An investment strategy where you maintain a constant dollar value in a security or mutual fund. For example, if a constant dollar amount of $100,000 was selected, whenever the value of the investment when over that amount a portion of the investment would be sold to bring the value back to $100,000. When the value went below the $100,000 level, an additional investment would be made to bring the total back up to $100,000. The ideal scenario is to be buying in falling markets and selling in rising markets. An investment strategy or formula whereby a predetermined ratio is maintained between stock and fixed income investments through periodical adjustments. A statistical index measuring consumer confidence with respect to the present economy and future expectations. Surveys and information compiled for the index and its' calculation is conducted by The Conference Board, a private business group. The most common measure of price changes of consumer goods and services. The index measures such things as food, housing, transportation, medical care, clothing, utilities, and services in selected cities across the country. The U.S. Bureau of Labor Statistics measures the CPI monthly. When the CPI is increasing, prices are going up and there is inflation in the economy. If the CPI were to decrease, there would be deflation in the economy. The period of time that an insurance company may challenge the validity of a life insurance policy based on material misstatements or concealment. This period of time is usually two years. Also see incontestable clause. In certain classes of mutual funds, a charge is made against the net asset value of the fund if the fund is redeemed within a predetermined time period. This back-end sales charge generally is reduced each year that the fund is owned. These charges are generally waived if the fund is exchanged for a fund of the same issuer and the same class. A person designated to succeed as the owner of an insurance policy if the original policy owner dies. The person who has the right to control an annuity. This person may or may not be the person who purchased the annuity. A pension or other employee benefit plan in which the participants make contributions to the plan. The plan sponsor and/or the participant may make contributions. Also see noncontributory plan. A type of bond that has an option that can be exercised by the owner of the bond to exchange the bond for an equity security (common or preferred stock) of the issuer. The bond will state the times and number of shares that the bond may be converted into. A type of preferred stock that has an option which can be exercised by the owner of the stock to exchange the preferred stock for common stock of the issuer. The preferred stock will state the times and number of shares that it may be converted into. Some term life policies have the option of converting into a permanent insurance plan regardless of the current health of the insured. Often this option is available during a limited period of time. During this period, the insured does not need to show evidence of insurability to convert the policy. This option is attractive when there is a need for a permanent plan of insurance, but the policy owner cannot currently afford the initially higher premiums of a permanent plan. A provision in a health insurance policy that eliminates duplicate benefit payments when there is coverage under more than one health plan. In health insurance, this is the percentage the insured pays toward the cost of covered services or a flat fee charged by an HMO or other managed care plan. The payments apply to certain services, such as doctors' office visits, hospital stays or prescription drugs. A rider on a life insurance policy or a disability income policy that adjusts the benefit to reflect fluctuations in the cost of living as measured by the Consumer Price Index. A bond for which coupons for each interest payment are attached at the time of the original issue. When interest is due, the corresponding coupon is then surrendered by the bearer in return for the interest payment. A type of trust that is used in the estate planning. The trust is designed to receive property equal in value to the unified credit for the first spouse at their death. In this way the property does not generate estate taxes in the estate of either spouse. A form of disability income insurance issued to a creditor on the life of a debtor. In the event that the debtor becomes disabled, the insurance policy pays the insured debt payment to the creditor. A life insurance policy on the life of a borrower that pays off the balance of the loan in the event the borrower dies. The face amount of the credit life insurance policy decreases as the loan is paid off and generally is a decreasing term policy. The policy can be issued on either an individual or group basis. A form of investment risk that is related to bond investing. The risk of an issuer of the bond failing or it's credit rating being reduced. This could involve the loss of all or part of the invested principal. A form of buy-sell agreement and insurance whereby each partner of a business purchases insurance on the lives of the other partners. This provides protection to the value of the business and can be in the form of life and/or disability coverage. An unfunded trust which acts as the owner of a life insurance policy. The donor's periodic payments are made to the trust from that the trust's beneficiary can make a cash withdrawal. If no withdrawal is made, the donor's payment is applied to the premiums due on the life insurance policy. A type of preferred stock that pays a predetermined dividend at regular intervals. In the event that the company is unable to make the dividend payment, any and all of the dividends due on the cumulative preferred stock will be accrued on the books of the company until the payments can be made. These accumulated dividends must be paid prior to any payment to the common stockholders. Each security that is traded on an exchange is assigned an alphanumerical identifier or CUSIP number. The identifier is assigned by the Committee on Uniform Securities Identification Procedures. The CUSIP number is displayed on any security trading confirmation tickets. Stocks that tend to rise or fall with changes in the economy. Examples of cyclical stocks would be stocks in the housing or automobile industries.